Make any beer and food pairing sing with Stuart Gardiner's handy tea towel. Whether you'd like to find the draughts that best complement your menu or you'd just like to make the most of the bottles you've got on hand, you'll be sure to make any pairing sing with Stuart Gardiner's handy tea towel. Printed in an array of autumnal tones that make it easy to locate popular beer types, this beer and gastronomical guide is perfect for those ready to add a few new brews to their favorites roster but comprehensive enough to please a seasoned beer buff. Simply select your beer or your food, then follow the grid: each towel includes 61 food entries and 40 beer styles, for a grand total of 2,440 combos! The towel gives you suggestions for perfect pairings, good pairings, ones to avoid, and a few surprises to boot, so crack open a cold one and raise the bar next time you dine. Made in the UK. Machine wash cold at maximum 50 degrees. Let air dry. Loved this little hand towel. It was such a successful gift! Bought it for my boyfriend as he just bought a house. He said he didn't want to use it because he wanted to frame it so it didn't get dirty. I said I'd just buy him another. Perfect for anyone who likes to drink beer and eat! This gift was a hit! My son loves trying different types of beer, and this pairing guide will definitely add to his enjoyment. This was a perfect gift for my craft beer enthusiast friends; I had to get one for myself. I am a huge beer drinker, but I always have trouble with pairings. 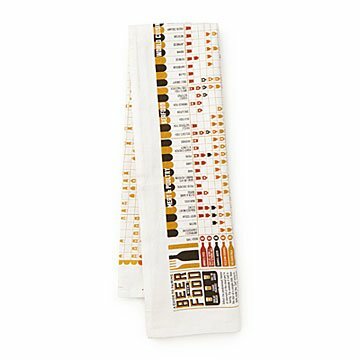 This towel is so easy to read and give really great beverage suggestions to fit each meal! This is a fun item. It has a LOT of info on it, so I am going to have them pressed, framed and hung in my dining room. This way everyone can enjoy them. Perfect gift for anyone who likes to eat and likes wine. Those are too great to use as towels. We like them for reference and fun. I would buy this again, and all the others like it! This is a handy, easy to read chart, which you can use as you are holding a champagne bottle or pouring the perfect Guinness. I have a friend who works for the Brewer's Association and is married to a man who brews his own beer. We had attended an event at the Denver Museum of Nature and Science that was an experiment to further the studies in beer and food pairings. When I saw this towel I knew it would be the perfect gift to commemorate our double date! They absolutely loved the towel and commented that they may frame it to hang in the kitchen as more of an art piece/resource than to use it as a kitchen towel. Another win from Uncommon Goods! This beer towel was a Christmas gift for my beer drinking son. He loved and thought it was cool.